One of the most popular tracks to make the Cross Rhythms radio playlist of recent times is the hugely emotive rap "I Hate You (Crack)" by a hip-hop artist from St Louis, Missouri who goes by the name of Thi'sl. 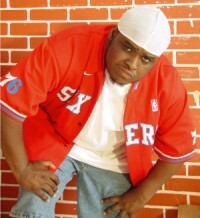 The track, taken from his 2009 autobiographical album 'Chronicles Of An X-Hustler', tells how Thi'sl was saved from a life of gangs, drug dealing and violence and called to minister the Gospel through music. Cross Rhythms' Tony Cummings spoke to the rapper and begun by asking Thi'sl about his background prior to becoming a Christian. He responded, "Well, I grew up in St Louis, one of the most dangerous cities in the US. I was brought up in a single parent home, just me, my mom and my lil' brother. I was basically raised by the streets and the dudes who murdered and sold drugs for a living. My mom was a drug addict so it was the streets where I learned how to survive. Before I became a Christian I was a hustler, a thug or as we call it over here a goon." Born Travis Tyler in Greenwood, Mississippi and later moving to St Louis, Thi'sl started to rap at the age of 14. At 16 years old, under the name of Uncle Y, Tyler cut his first demo but at this time he was heavily involved in the gang lifestyle. It took the murder of his cousin and close friend, Tank, to prompt Tyler to ask God why this had happened. Tyler went to see "holy hip-hop" artist Flame, who was performing at an evangelistic event in his neighbourhood, and the pair became friends. Tyler began to read the Bible and after a year and a half felt the calling to use his skills to communicate the Gospel. Under the name of Thi'sl, Tyler began to perform at churches, schools and prisons to a great response. He explained his unusual moniker, "It means This House I Shall Live. Our bodies are the temple of God's Spirit. His Spirit is with me and I go forth in that manner." In 2004 Thi'sl independently released his debut album 'This House I Shall Live' to positive reviews. But Thi'sl felt better was to come. "Lots of people loved it, I did as well, but I was still growing and finding my lane," he admitted. The album, which featured old pal Flame on the track "Head On", was re-released in 2007 with extra tracks. In 2006 Thi'sl released an album called 'The Ezekiel Project Vol 1: The Breath Of Life'. Based around Ezekiel 37:4-5 the project was designed for churches to purchase the CDs and hand them out to young people. Does Thi'sl think that a lot of the Church seem prejudiced against the whole hip-hop genre? "They don't know how to separate the music from the culture, it's all the same to them. These days the Church don't understand the role of missionaries in the urban context. Hip-hop culture is in desperate need of God and any culture you go into as missionaries you need to learn the language of the people so you can communicate with them. Rap music is the language of hip-hop culture and is quickly turning into the language of the world. Why wouldn't we use it to preach the Gospel?" Why, Thi'sl was asked, are so few US Christian radio stations playing hip-hop? "They don't understand it and it doesn't make them enough money," the rapper answered candidly. "Christian rap labels are small for now and don't buy lots of promo time. Most radio stations are businesses and they cater for the demographic that pulls in the bucks and keeps the bills paid. Stations are moving into it more and more these days because they see the people want to hear it and the people control radio. And by the way, thank you guys for playing my record, a record as edgy as 'I Hate You (Crack)'." 2009 saw the release of 'Chronicles Of An X-Hustler', an album Thi'sl says is the soundtrack of his life. What does he remember about the recording sessions for the project? "Experiencing the power of God! I didn't physically write down any of the songs on the album except 'Picture On A Shirt'. With the rest of them I was either in the car or in the studio, vibed, and wrote the songs in my head. I remember being in the studio recording 'You're The One' and literally going into worship. Even in the mixing process, we had to fix this one part on the Flame verse on 'I Aint Turning Back' when he said, 'Where will we go back to our grave.' It rocked me over and over." 'Chronicles Of An X-Hustler' features some unfamiliar guests like Brothatone, Pastor Ad3, Blair Wingo and Fitzgerald. How did they come to be on the album? "I am pretty much close with all the 'names' in Christian rap but I didn't want to flood my album with 'names'. I first heard about Brothatone on the internet and I reached out to him because his style is grimy like mine. Pastor Ad3 I met through a mutual friend that insisted on me hearing him. When I heard his music I was in awe and I knew I had to work with him. Blair is from a ministry based in LA called Passion For Christ Movement. I first saw their ministry on YouTube, they were going hard with the Gospel outside the BET Awards so I looked them up and I saw Blair doing poetry. I was an instant fan. Fitzgerald was one of the first people I met as a Christian and we have always worked behind the scenes together. This was just an opportunity for him to be in front. They are all worth a Google!" Clearly "I Hate You (Crack)" is autobiographical. What led to the writing of the song? "There was a lot of pain and the need to vent. I was in the 'hood one day and I was just sitting back observing what was going on. I saw my cousins and homeboys doing their thing, doing what they do. I was thinking 'bout all the stuff I had lost in the 'hood and all the pain I had felt. My aunt came walking up and it all hit me. I went to a studio and I prayed, 'Lord, let me express this pain to the rest of the world.' I just didn't want to vent but show people another side of the 'hood that rappers don't talk about." What kind of gigs does Thi'sl play and who is in the audience? "All kinds of folks make up my typical audience. I have 40 year old Caucasian women hitting me up on Facebook saying, 'I love your album', then I have 'hood dudes that hit me up like, 'Fam, that bleep bleep bleep tight'. I look out into crowds and see all kinds of faces and mixed races. I also play at jails, juve centres, all that, it doesn't matter. Wherever God sends me I'll go." So, what plans does the X-Hustler have in store for the future? "Right now I am currently on tour, The Urban Missionary Tour, which will be hitting the UK on September 25th in London. I am also working with a couple of artists in the US. One is my homegirl Jai, she is a phenomenal artist. I'm featured on her first single 'Incredible' that will be released soon. I also just started working with a group called Forever. Oh yeah, we've also got a compilation coming up called 'Kingdom Grind' and, of course, I will be working on new solo stuff. I will definitely keep you posted." Chronicles of An X-Hustler is such a great album! This'l is real and passionate from beginning to end! I like his transparency and his ability to relate. I highly recommend this ablum. It is definitely worth buying!